Dassault issued Falcon Service Advisory FSA900EX-54-10-02-R5 in 2009 after receiving reports from F900EX operators about a brown discoloration and in some cases a distortion of sections of the S-duct inner skin. Multiple pulled Spot Welds in inner skin of the Falcon 900EX S-Duct. The distortion of the inner skins of the S-duct was determined to be an overpressure due to an excessively open HP valve, combined with a high N1 setting. 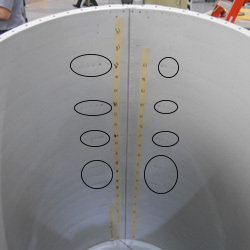 Dassault has modified the design of Section #1 of the S-Duct to correct the distortion. Since the introduction of this redesign, the number of distortion reports has significantly reduced. I want to remind Falcon 900EX operators that Dassault Falcon has a Special Commercial Program for the Falcon Service Advisory FSA900EX-54-10-02-R5 that extends the warranty on materials and provides a discount program for parts if exchanged prior to failure. This program is for F900EX S-duct Sections 1, 2 and 3 that are made of 2024 aluminum alloy and is limited only to the correction of the discoloration and distortion issues discussed above. Material warranty is extended from five to 10 years. Labor warranty is extended from six months to 3 years. No repair will be done on a part under warranty. Any section with cracks will be systematically exchanged with a new part. If your F900EX is six year old or less, you will get a 50% discount off the regular new part price. If your F900EX is 12 years old or less, you will get a 25% discount off the regular new part price. If you have any questions about this FSA, don’t hesitate to ask me or any of the other Duncan Aviation Falcon Tech Reps.
Kevin Bornhorst is an Airframe Tech Rep located at Duncan Aviation's Battle Creek, MI, facility. He specializes in the Falcon airframe. His aviation career began in 1982.